In 2010, while I was on maternity leave with my 1st son I scoured the Internet to find work at home Jobs that paid more than the equivalent of a pack of gum…guess what, I didn’t find it. So, I want to pass along the best work at home jobs of 2018 that pay BIG BUCKS to you so you don’t have to dig through the junk to find the good jobs. 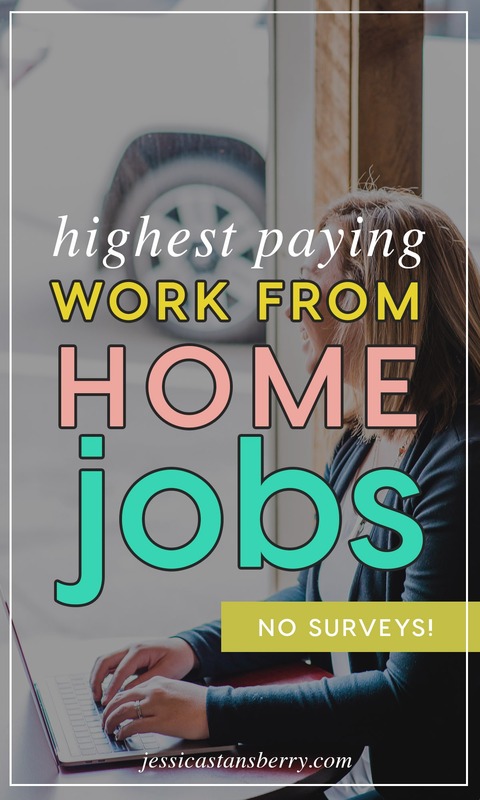 Whether you’re a Mom trying to find the best work at home jobs for moms or just someone who’s ready to make money online, this article will hopefully provide everything you need and, if it does, make sure to share it with your friends. It seems like the dream job for everybody right now is the work from home and, while it is really nice, it can be hard to find the perfect job for you and what types of flexibility you need so I have THREE jobs that are going to land you in the best position for your needs. Want to watch the video version of this post? Yeah, I get it – that’s easier said than done but it’s the ONLY job you can do from home where you truly make the rules and so many people overlook this option when they’re talking about working from home. This is exactly what I did, I started a graphic/web designer and have molded my business to fit my needs and expertise since then.Pro Tip: Your current corporate job may hold the key to what type of business you should start; are you an awesome bookkeeper? Do that. Do you love to do data entry or general admin tasks? Become a VA. So many large companies use virtual staff to handle their customer service since it fits their needs better (hey 24 hour customer support) AND because it keep their overhead down so you should take advantage of this if that sounds like something you’d like. Sites like Arise.com can help you find these jobs and apply but several companies post virtual positions in standard job postings and on job boards so definitely check those out. I think this might be the oldest of the work at home jobs (outside of starting your own business) but it’s one that thousands of people still do today. Medical transcriptionists and data entry professionals work from home every single day and there are even certifications to help you do these. Work at home jobs in 2018 are in NO short supply but sometimes they can be daunting to look for and you’re always afraid of being scammed on the Internet – I TOTALLY GET IT. So, hopefully this list helps get you started in the right direction. If you’re intrigued by starting your own business, make sure to sign up below for access to my FREE library of resources to help you run a successful business online.